On Wednesday afternoon, following the meeting of the Federal Reserve Open Market Committee, Chairman Jerome Powell reiterated his stance on remaining patient when it comes to interest rates. Chairman Powell and his policy team essentially took an interest rate hike off the table for the balance of the year owing to the slowing pace of growth combined with (or maybe because of) global uncertainty. Gross Domestic Product (GDP) projections were lowered for 2019 and 2020 and far be it from me to disagree with the Chairman of the Federal Reserve and his team. They have far more resources at their disposal to make this assessment than I do. What I can do is study what is happening in the market to make a probabilistic determination about which themes are likely to persist over the next three to six months given this “slowing” growth environment. My thesis is that if growth is slowing, investors are likely to pay a premium for “growth.” Additionally, given the global uncertainty, I believe that investors will favor the relative safety of large cap stocks over small cap stocks. Look no further than the “FAANG” stocks for confirmation of this view. Here is an index that I built to measure the performance of FB, AMZN, AAPL, NFLX and GOOGL. After pulling back with the market, the index has rallied from the December lows to retake the rising 200-day moving average. 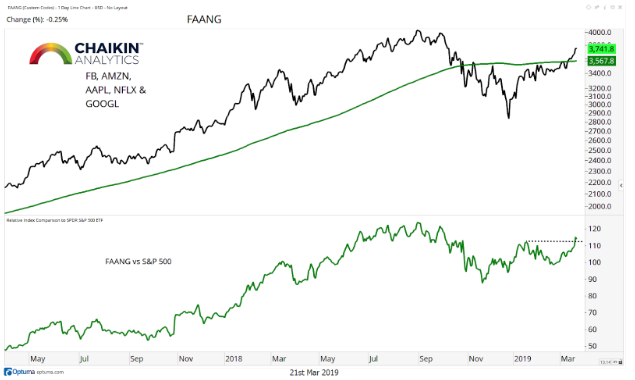 At the same time, the FAANG stocks have broken through resistance relative to the S&P 500 (bottom panel). Given this view, investors can see a potential benefit to their portfolios by increasing their exposure to the products which stand to benefit in the current environment. All seven have a Bullish Chaikin Power Gauge ETF Rating which is comprised of a Technical Rank, an Average Power Gauge Rating of the holdings and a Weighted Power Gauge Rating of the holdings. However, the iShares S&P 500 Growth ETF (IVW) has the strongest Technical Rank at Very Bullish so we will focus on that one here today. IVW has been outperforming the SPY since February. The fund is above the rising long-term trend line and has broken through the interim highs from October and November. 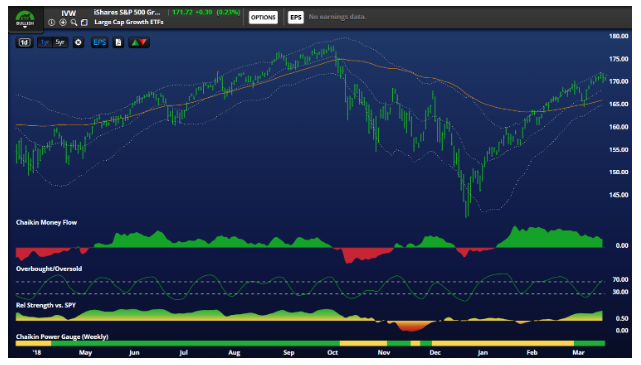 Chaikin Money Flow is bullish, as it has been for the majority of the time since last May. This tells me that investors are accumulating the fund and that the recent trend of outperformance is likely to persist. My only concern, in the near-term, is that fund is overbought based on our Overbought / Oversold Indicator. Investors who are more trading oriented may want to wait for the indicator to reach an oversold reading before getting involved. However, longer-term, strategic investors who are looking for exposure to the Large Cap Growth theme, may want to consider allocating a portion of their portfolio to a fund like IVW. Obviously, there are other themes in the market which are likely to emerge and I could write all day about the ones that I find the most compelling and how to find ideas to express a bullish or bearish view. For now, I wanted to highlight the new screener and how I use it on a daily basis based on the trends in the market. We love feedback, let us know if you agree with this view and ways that you are positioning to take advantage of it. Also, let us know if you disagree. We always learn more from hearing the other side of the idea.